Affiliate Marketting Programme is intermediary between publishers affiliate marketers who sell and advertise many products, provide visiter traffic and services online . Website owner/Creater/Publisher can earn Revenue by Promoting native/pop ads of Affiliate Network. 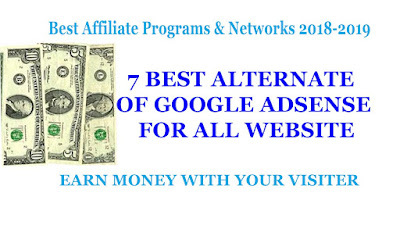 There is no other option of Google Adsense ads network. Google Adsense is this world's best advertise publisher for content creater/Publisher . But Deu to google adsense programme policy Google adsense does not Approve all Primary Artical language. hindi language support google adsense but nepali language artical does not support by adsense. in this case you can choose different alternate Affiliate network for moneytize your web traffic and you can earn money from website. The Alternate of adsense affiliate networks providing CPS (Cost-Per-Sale) and CPA(Cost-Per-Action) Basis Ads. Media.net is Yahoo’s contextual ads network. this is the best way of ads network if you dont get verifyed with Google adsense. Media. net Provides publishers to earn revenue from their websites & Blogs displaying attractive ads. This network Offer CPC Types Ads for publisher. Media.net is the second largest ad network after AdSense. publisher Website Language Must be primarily in English. media.net does not support nepali/hindi language so you can not get approve with nepali and hindi language. With these content Adult, Tobacco, Alcohol, Ammunition, Hazardous Substances, Illegal Drugs, Gore, Violence, Gambling, Racism, Hate, Racial Intolerance, Prescription Drugs, Counterfeit Products, Stolen Items media does not approve even your artical in englsih language. This Network does not recomanding minimum traffic. infolink also based on cpc ads network. it might be next way to moneytize your website if you don't get aprove from media.net. you can earn more revenue with infolink affiliate programme. This Network supports websites in English and Spanish Language but you can also aprove with nepali and more languages. so you can not get aprove from nepali and hindi language. Tabola is the another best Native ads Network to moneytize your traffic. You can earn higher revenue from taboola. This site does not recomanding for language so you can earn with nepali/ hindi and many more language artical. if you are small and begainner publisher very hard to get aprove from Taboola Because they recomanded minimum vister. To join this Toboola publisher programme Your site must be very famous and minimum vister must be at least 50,00,000 per month. recently ujyaalo90 network online using this type of ads on nepal . they have much traffic on site. Facebook audience Network also higher payer platform for artical publisher. its cpm/pcc ads network, facebook serve intertial, native and banner ads on instant artical, facebook support many verities of language. You can earn money with nepali language website too. to appy facebook ads programme you need to be Facebook page. they does not aprove with your facebook profile because page is for business propose. even if you have lower page likes and follower you can get aprove for facebook instant artical. You need to free business account on facebook to aprove your app. they does not recomanded minimum visiter but facebook instant artical policy is very strickly. You can join here if you have facebook page and custome domain website. Blogger platform site also support for facebook instant artical apply. But you need to custom domain name. Blooger is free hosting platform so your money will save. You does not need to pay as wordpress and other php site hosting. Mgid is the best way if you don't get aproved with media.net, infolink and taboola. To get aprove on Mgid Publisher Language must be in Primarily English But Mgid allowed other languages too. So you can get approve with nepali and hindi language artical. Mgid does not requairement minimum trafic officially. if you have 5,000 visiter per month you can get aprove from mgid. its also cpc base ad Network. mgid provide clear ads like Integrate sponsored content or recommended products into the user's natural activity mgid does not viewers with unwanted disruptive ads. you can get approve within 24 hours after the application submit. so its the best way to moneytize indain and nepali publisher. Mgid Pays with Paypal, Payoneer, and wire Transfors. Mimimun payout is 100$. Amazon affiliate another way to moneytize for your web traffic. this is CPS base affiliate network. You can earn money by selling Amazon Product Online. You can apply amazon affiliate programme it is cpc network so you can not earn revenue by visiter clicking ads. To earn revenue your visiter must be buy any product via your referral link on amazon official site. Bidvertiser may be your another choice to get revenue from your website. You can get very easily aproved on Bidvertiser. no minimum traffic recomanded, no language recomanded. You can earn money with any language of artical website. this cpc based ad network. they provides native/popup many types of ads to earn more revnue.